Today’s time PDF is playing one of the most important role in our life. So whenever we develop any asp.net application on that case we always face some situation where we needed to export our data in PDS format. 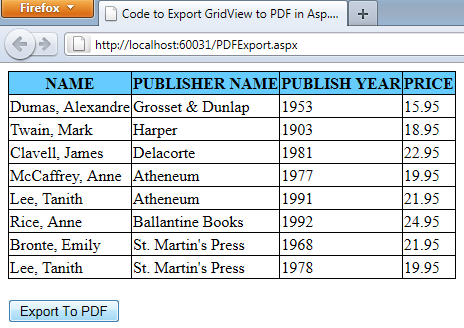 So in this article I will show you how you can export the GridView bind data in PDF format using third party control iTextsharp. So for this article first you needed to download the iTextsharplibrary. Download iTextsharp and extract the zip file. In this file you will three dll files. So for completing the task add the reference of itextsharp-dll-core directory dll. Now after this create a new asp.net application and add the blow code in your .aspx page. Now we will go to code page and add the below code. using iTextSharp.text.html.simpleparser;//This name space present in "itextsharp-dll-core"
'This name space present in "itextsharp-dll-core"
Public connectionstring As String = "Provider=Microsoft.ACE.OLEDB.12.0;Data Source=|DataDirectory|\bookstore.mdb;Persist Security Info=False;"
Dim querystring As String = "select * from Books;"
Now run the application without adding the below mention code function. Click on export button, you will get below mention error. Dear Reader Please let me know you comment. Thanks for you valuable comment. Interesting. Good to know about it. Nice article. I like this post. it is very useful.Thanks for sharing. interesting piece of information, I had come to know about your web-page from my friend pramod, jaipur,i have read atleast eight posts of yours by now, and let me tell you, your blog gives the best and the most interesting information. This is just the kind of information that i had been looking for, i'm already your rss reader now and i would regularly watch out for the new posts, once again hats off to you! Thanks a million once again. You are an amazing writer. The content is extra-ordinary. Reading your article gives me an inspiration. Thanks for sharing. Awesome post with great piece of information. Thanks for sharing this with us.